Undercover Cops - HOO BREAK IT DOWN!! Don't play the World version of Undercover Cops! It's missing several features! If you want the game in English, play the Alpha Renewal version instead, otherwise play the Japanese one! Nazca. 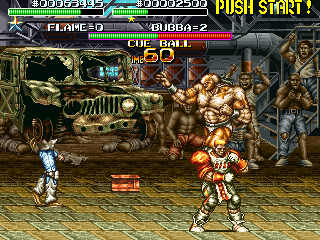 The team who made Metal Slug. Consisted of former members of Irem. Several of them worked on Undercover Cops during their time at Irem, here's a list. With that essential context out the way, let's begin. 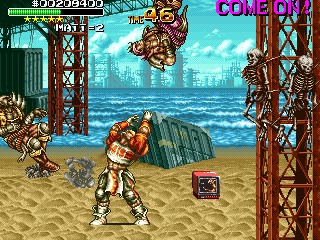 So, Irem is a bit of an oddity in the realm of scrolling brawlers. 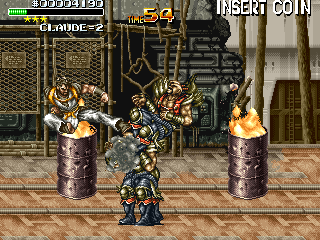 technically they got in on it early- Kung Fu Master could be seen as a very early predecessor to the genre, but they only put out four Final Fight-style ones in the arcades. 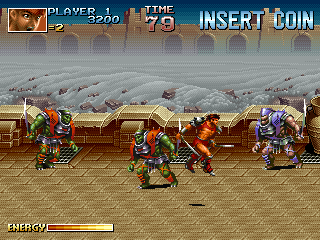 Two of which can be neatly slotted into subgenres- specifically the licensed tie-in brawler (that'd be Hook, of all things) and the Golden Axe-style weapon brawler (that'd be Blade Master/Cross Blades! )- and the other two that are definitely their own thing. 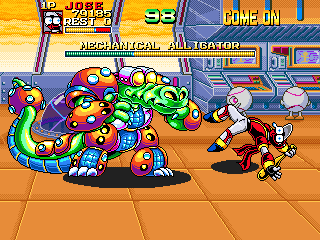 One of them, Ninja Baseball Bat Man, has a website by the game's creator and is one of the most visually over-the-top brawlers ever made... 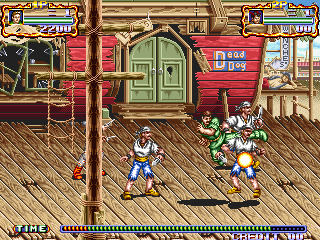 But while it was also Irem's final arcade brawler, that's not the one that's got my attention today. 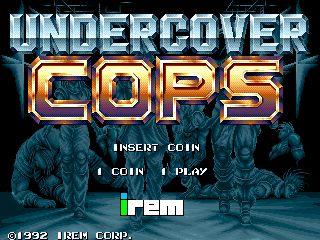 That'd be Undercover Cops, which as we've already said was worked on by Irem staff members who would go on to form Nazca and make Metal Slug, and just one look at a screenshot of the game would leave no doubt that the Metal Slug tea worked on this. As one of three City Sweepers (who, despite what the title implies, don't seem to be Undercover Cops and just beat all the bad guys up with no sense of stealth or subterfuge at all), you must take to the streets and stop the evil Dr. Crayborn from taking over the city- no, the world- nay, the universe, in this clearly post-apocalyptic world. At first brush, Undercover Cops is a pretty standard brawler, but there's a couple of foibles here that give the game character. For a start, the move repertoire is fairly advanced for a game from this era- you have a standard combo chain (with a special throw at the end or a combo finisher depending on distance), a jump attack, a dash (run for Matt), a dashing jump attack, a wake-ip attack (), three different kinds of throw for each character, and both a normal Desperation attack that takes a little bit off your health and a Super Desperation attack that covers the entire screen and shaves a lot off your health. Additionally, the items and weapons you get are different from the norm. Instead of itty-bitty knives and steel pipes, the weapons in Undercover Cops are all over-the-top, including steel girders, concrete poles and even motorbikes that you can just grab and throw! The health items are definitely the strangest though, as in these post-apocalyptic times, food is scarce, so alongside normal things like coffee and full dinners, you've got, erm, actual live animals like a lobster flopping about, a full pig, and a chicken complete with chicks (that yes, you can eat, you monster). This isn't just a bit of dark humour (although it's done tastefully- they just appear when they're grabbed), it actually affects the game- the 'live' food often moves about and will keep up with you as you scroll the screen. So if you find a mouse but don't quite need a health boost just yet, you can bring it with you and take it when you're feeling a little worse for wear. Neat. The last foible is the Finesse Points system- doing certain moves against certain enemies gains you little stars, used in the post-mission assessment, but we'll see that later. Anyway, let's have a closer look at our three dispensers of justice. He used to be a karate master and had won first prize in the U.S. Championship before. One day while he was trying to protect his girlfriend, he got into a fight and accidentally killed a man with his bare hands. Personally my least-favourite character of the trio, mostly because he's not a stand-out in any particular area. 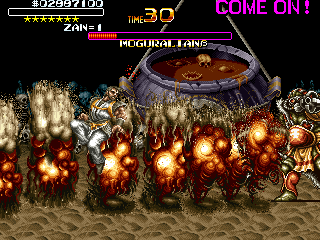 One of his biggest weaknesses is that his dashing ground attack has some weird timing on it compared to the other characters, which means you won't pull it off right when you need to, which is particularly bad against bosses like Moguralian β. Having said that, his normal attack is very fast, and his dashing jump attack can catch enemies off-guard on occasion. He also has a little more manoeuvrability with his normal desperation attack, as he can jump left or right with it if you hold the direction, and Zan Kidan is pretty effective. Just... Not my favourite though. Sorry, Zan! He used to be a football star who had won M.V.P. before. Although falsely accused, he was censured for being a dangerous man and was banished from the world of football. Although he looks like the archetypical 'slow-but-strong' character, Matt is surprisingly versatile- he walks slowly, but he's the only character who can run instead of a set dash, and his running shoulder charge is extremely effective when used to get close to the enemy (it works especially well on bosses and the bat guys). Also, his desperation move (where he slams a glowing football into the ground) lacks the manoeuvrability of Zan and Rosa's moves but has a huge invincibility window and an impressive range, and he's an absolute beast with weapons, swinging them much faster than everyone else. His main weakness is that despite his run he's still quite slow, and his normal attacks aren't as fast as those of Zan or Rosa, although his shoulder barge, with the correct timing, can make that a non-issue. Learn how to use him correctly, and Matt is probably the most effective city sweeper- just watch out for those cat-girls! She used to be the only female vigilante. Thomas who was ber partner and her lover was killed by villains, she has an excessive hatred of evil. For those without a doctorate in Irem lore, Thomas is the name of the dude from Kung Fu Master- I guess Mr. X got the better of him after all. Anyway, I'm sure you can guess what category Rosa falls into. 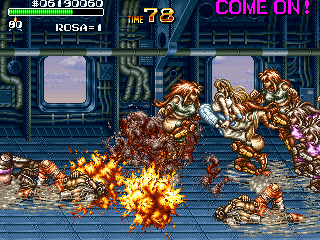 Yes, the standard fast-but-weak member of the group, Rosa's speed makes her ideal for getting the jump on bosses (especially if you can learn the timing of her dash kick, which can catch them unawares sometimes) and her normal combo comes out ridiculously fast, which can lead into throws very quickly (including an amusing one where she whips the enemy with her hair). 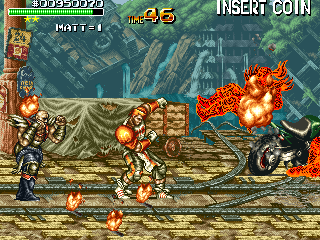 She also has the most effective super desperation move, but her normal desperation move isn't as good as Matt's and her low power means she struggles against the dreaded bat guys more than the others. ... Of course, pretty much everything I've said up to this point- about the moveslist, in particular- applies only to the Japanese and later Alpha Renewal Version of the game. This is where things get a little weird, so bear with me. The World revision is missing several things- specifically, the run-and-jump attack (if you try to jump during a dash, you get the dash attack instead), the wake-up attack (whacking the buttons just gets you up faster instead), any throw variants beyond the standard and hitting in place (finishing a combo close-up just gets the standard throw rather than anything fancy like Rosa's hair-whip-grab) and each character's Super Desperation Move (the commands simply will not work). Additionally, the music is quite different, with most of it using lower-quality instrumentation with almost all the voice clips gone, and in some cases they have completely different melodies! There's also a few visual differences, although most are pretty minor. I can, to an extent, understand why someone might prefer the soundtrack in this version- if cheesy voiceclips aren't your thing, the Japanese soundtrack has them in spades- but the other changes make this a worse game. Quite why Irem released the game in this state is a mystery, but none of these problems are present in the Japanese version. They must've known, though, as another revision of the World revision, Alpha Renewal Version, also exists. 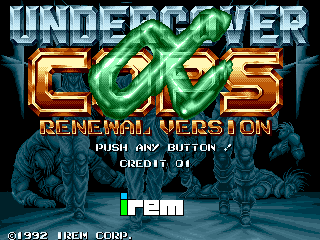 Apparently very scarce- it took until 2007 for it to get dumped and supported in MAME- this keeps the World names for characters and bosses, but restores the missing moves, updated music, and other bits and bobs that were missing (except for Rosa's secret credits theme, sadly). It's the definitive English release, in other words. So, for this playthrough, we're predominantly going to have screenshots from the original Japanese version, with English text provided by the Alpha Renewal version, and select screenshots from the World version where necessary. If you want a quick look at the differences with the World version, then we've put them on this page. Otherwise, we won't be seeing the World version here! With all that essential info out the way, it's time to hit the streets- let's play Undercover Cops! So, you want to engage in some beating up like hell? Click me!